Dramatic stories are exciting. Sometimes. Not smooth (boring) stories, but unfathomable stories. Stories that surprise you. My experience with Studiologic Sledge belongs to this latter category. It’s been many years since I first played the YELLOW Sledge (Version 1.0). And turned away in horror. What a shiny plastic box! What a wobbly keyboard! But things change. Today the Sledge Version 2.0 or Sledge BLACK Edition offers lots of new goodies, including a decent Fatar TP/9S keyboard. Which looks (and feels) much better! My recent, decisive encounter with the Sledge lies only a few weeks back. Those were turbulent times. In front of me, waiting to be tested, the 8-voice hybrid desktop-synthesizer of another highly esteemed company. I was a little uneasy, something I can’t explain. I played and twisted and twisted and played. Despite those good sounds, tantalizing possibilities and outstanding features, I just wasn’t convinced. The “now I’ve got it!” eluded me. As I casually pressed the key of another synth – distraction is good – it dawned on me: This is it! The sound, the character that invites you to linger and enjoy. Inspiring. Your mind takes flight. No technical description can give you a hint of this sunny reality. Some instruments have it. Some don’t. Ok, ok, this is just me. Others might feel entirely different about that well-known hybrid desktop synth in question that I was unable to test successfully. I can only speak for myself. In that moment of sudden insight, a little Sledge BLACK ad in a local newspaper caught my eye. Very unusual, considering that my home country – as far as synthesizers and other electronic sound generators are concerned – is more of an Atacama Desert than a Silicon Valley. A parched area where even the word “synthesizer” seems like a mirage, like a misprint on paper. But that instrument really existed: Sledge BLACK was less than a 10 minutes’ drive from my apartment. The handover took place that same evening. With the arrival of the Sledge BLACK in my studio, long nights of sound research began. Hours over hours with lots of music and little sleep. It soon became evident that the Sledge had exactly that which I had been looking for. The magic which radiates from an intuitive instrument. Granted, the Sledge remains a fulminantly plastic box. But now with a passable design and with an useable keyboard. When sifting through the Sledge information on the net, a confusing detail pops up: the image of a Fatar CMS 61 keyboard from 1994, which has originally nothing to do with the Sledge. A primeval controller keyboard from those days when computer monitors resembled pot-bellied TVs and “MIDI” was an exciting cool feature. 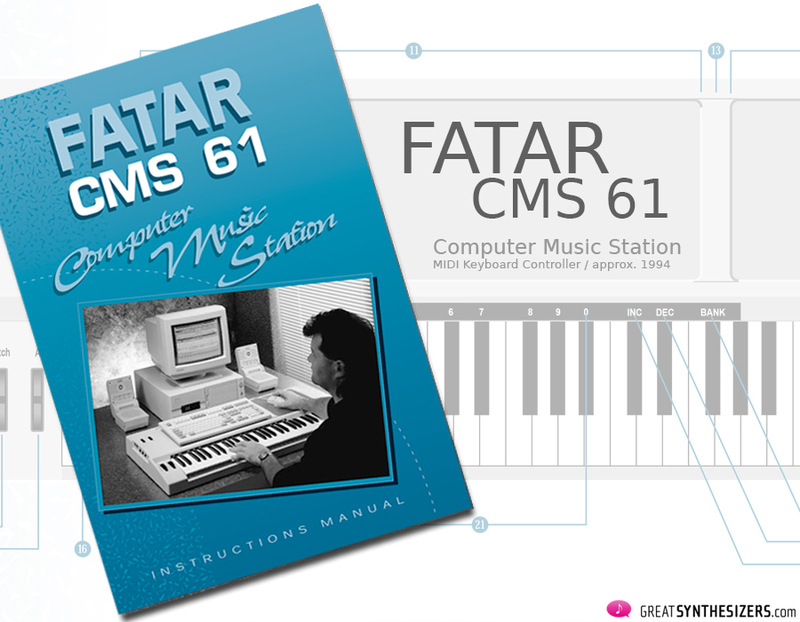 The said CMS 61 was launched to play music data right into the computer, and to have enough space for the computer keyboard and for a mouse as well. Off to a classical start. The tasteful design of the Sledge BLACK impresses. Black pots, two orange (!) knobs, glowing red switches … everything clear, everything extremely well-structured. At the back nothing but the power connection and the power switch. All other connections are on the left-hand side. This might give cause to the one or other sceptical frown (after all, the Sledge does need extra width for its cables), but the direct access to all in/outputs has advantages. Side cabling means easy accessibility – no lifting, no moving the instrument. Although we have to admit that moving the Sledge isn’t such a big deal. With its 8 kg (! ), it is amazingly light. Sure, the chassis is definitely plastic, but nevertheless robust and of a solid overall construction. The pots are big (some of them even huge). In short: The quaitly of the hardware is – as soon as you have accepted all that plastic – really good. To be honest, I would have preferred a keyboard in the usual black/white pattern (being of no detriment to the name Sledge Black Edition), simply because slightly dirty, smeared areas are more evident with the inverted color combination. So, either wash your hands well before playing the Sledge BLACK, or clean the keyboard regularly with a cloth. Or both! Black, smooth surfaces are just prone to smudging – which recently became unequivocable evident with the appearance of the Roland JD-XA. The Sledge pitch bend and modulation wheels are made of rubber. They are both comfortable and flexible to use (more on that later). Small note: The free space left between the jacks and the actual synthesizer panel, where the labels of the inputs / outputs are, is ideal for storing headphones not in use. Whether or not this was intended does not matter. It’s extremely convenient not to have to put the headphones over the buttons and switches. That corresponding free space for storage is right next to the headphones output! Unspectacular, maybe, but a detail among many that, in sum, lend the Sledge its special aura. Conclusion: Considering the low price of the instrument (under 1000 Euros), the hardware is good to very good. Ample space, large pots, solid controls and luxurious labels yield a clear and extremely user-friendly environment. Since daydreaming is allowed, we admit that we wish that the panel could be raised and tilted. 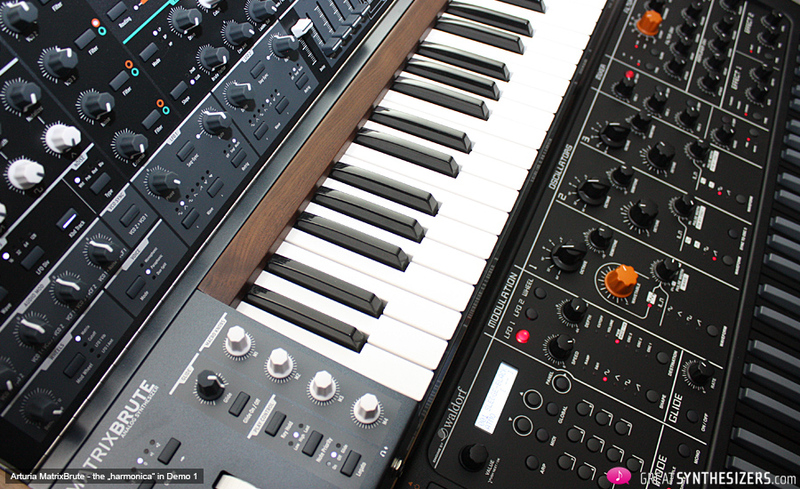 Think of the Arturia MatrixBrute or the Hartmann ’20. But given that plastic chassis, any thought of a “mechanically moving panel” is a first-rate illusion. And so we must accept the revised CMS 61 design – a “table board with buttons” called Sledge – which services the Sledge musician well with a large (flat) panel. The heart of the instrument. 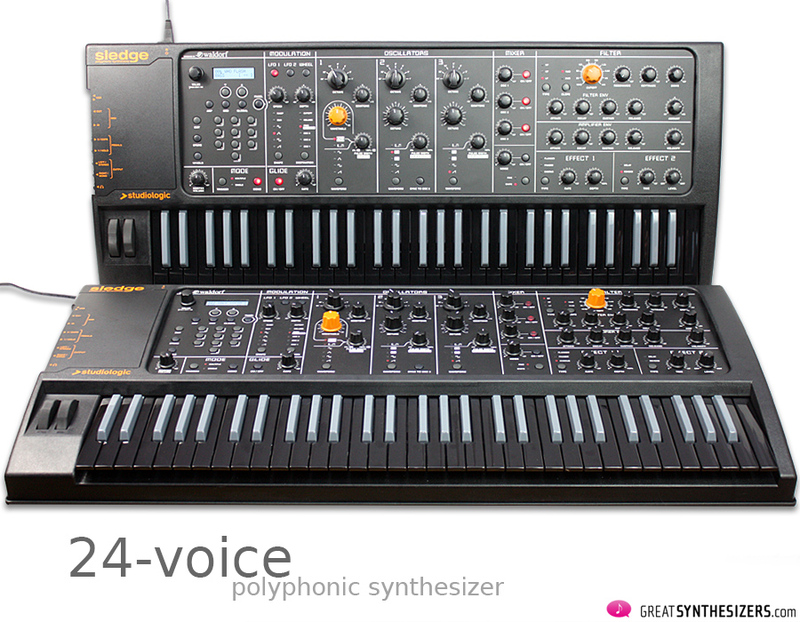 Sledge 2.0 / Sledge BLACK: A 24-voice virtual analog synthesizer with integrated PPG-wavetable oscillator and sample pool. Exciting: The simultaneous activation of traditional analog waveforms with wavetables (or samples), in turn leading to completely new waveforms – with direct access to all sound-control parameters. Oscillator 1 is the BIG ONE. 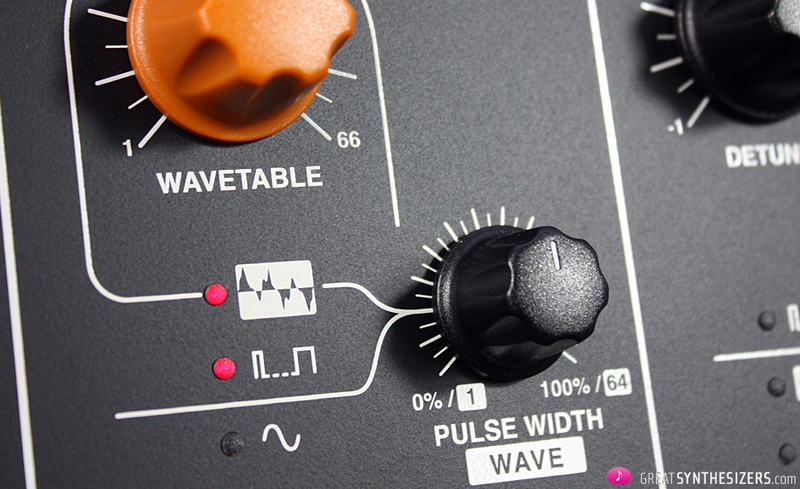 Useable as a classic “analog” oscillator, or – as we’ve said before – as wavetable / sample-play oscillator. 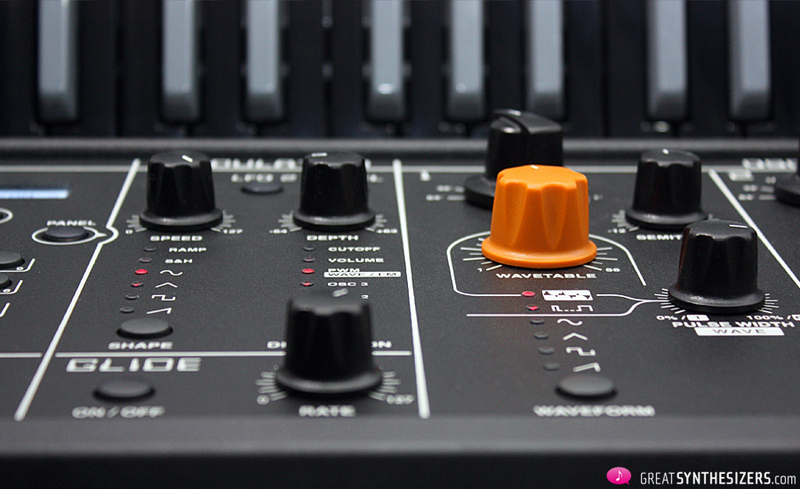 Particularly pleasing: That orange knob for wavetable selection. 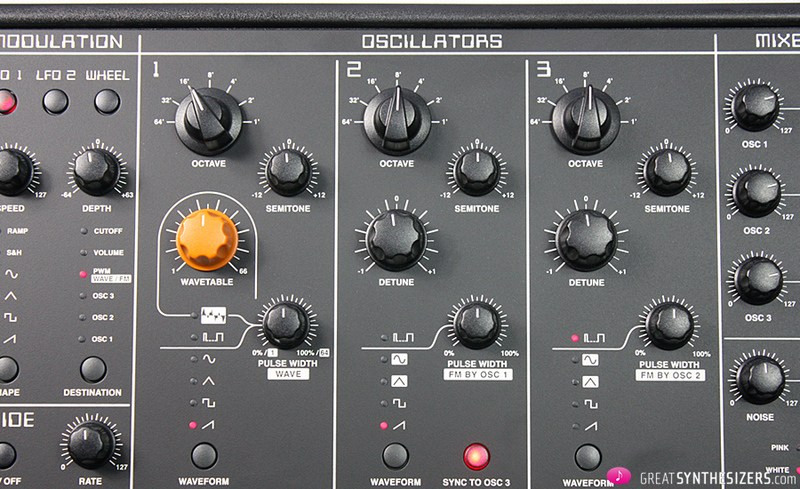 Oscillators 2 and 3 are classic virtual-analog oscillators with an extra extra. Both offer sawtooth, pulse (with PWM), triangle and sine. The extra extra is frequency modulation (FM). 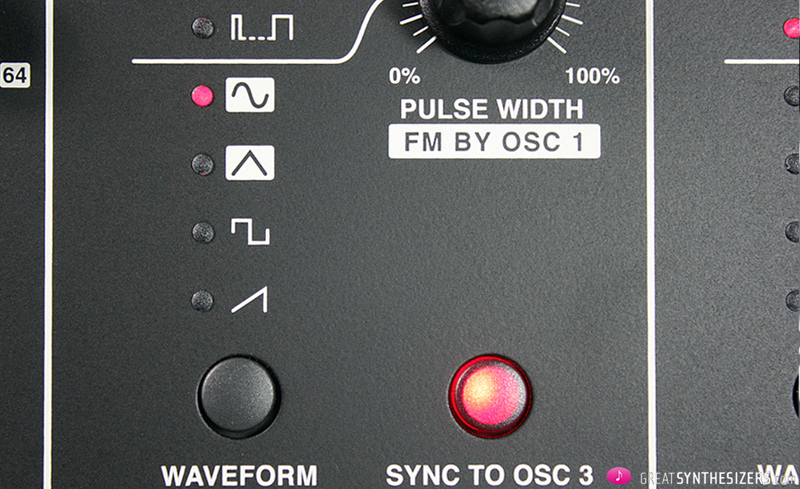 Oscillator 2 can be modulated by OSC 1, Oscillator 3 by OSC 2. Finally you can have an obligatory osc-synchronization between oscillators 2 and 3. The frequency modulation (FM) is a real smash. 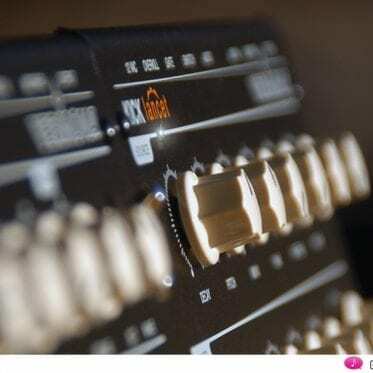 Bear in mind that Oscillator 1 is enormously well equipped with classical waveforms, wavetables and samples, meaning the sound spectrum of OSC1-to-OSC2-FM exceeds your wildest dreams. By the way: FM amount is seamlessly adjustable from 0 to 100% … from those “shiny” overtones to wild FM effects. Also amazing: The OCTAVE switches. Huge knobs with 7 (!) stages from 64′ up to 1′. Which means a switchable audio range of 6 octaves, PLUS another 2 octaves via (+/-) 12 SEMITONES. That’s a total of 8 (!) octaves per oscillator — at your fingertips. The Sledge makes sense it a lot of ways. Mix a deep, deformed “glassy” wavetable (64-foot, Oscillator 1) with a fringed sawtooth (1-foot, Oscillator 2) and a shimmery FM modulated triangular wave (16-foot, Oscillator 3) – and you end up with a waveform you probably have never heard before. It’s that tasteful waveform-mixing that creates new, richly detailed timbres. And that makes the Sledge particularly useful. 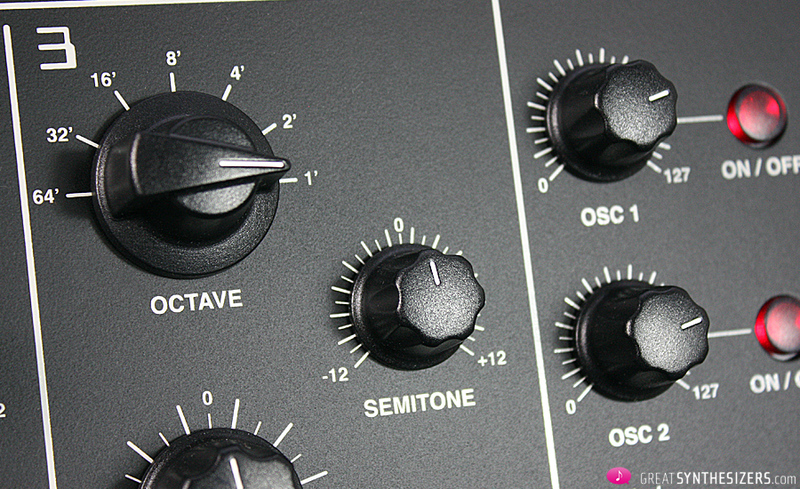 Classic Minimoog style: All 3 OSCILLATORS can be mixed, plus NOISE (selectable: Pink or White). 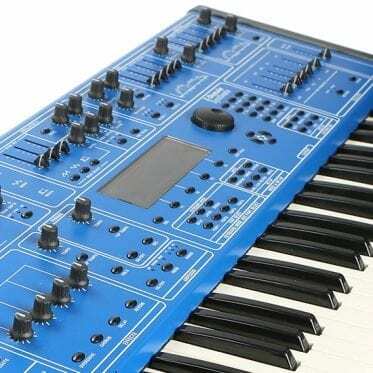 Incidentally, noise is “not” as noble as that emitted from a real analog synthesizer. It sounds a little – well – synthetic, with the occasional inexplicable artifact in its acoustic landscape. Useful just the same. Back to the mixer. 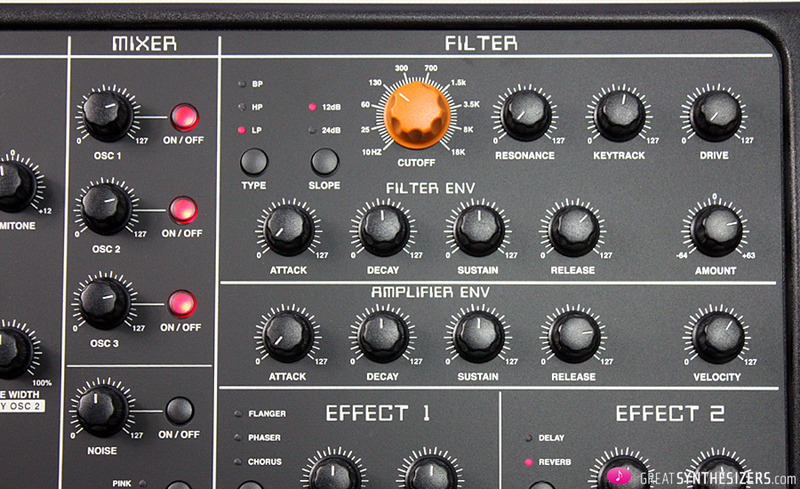 As with the Minimoog, you can switch all individual audio sources on and off. Great when performing Sledge LIVE. Depending on the musical situation, timbres can be precisely added or disabled. Finally, when serving as modulation sources (keyword OSC FM), oscillators can be quickly and easily removed from the audio path. Via MIDI CC, however, there are even more filter types to choose from! Specifically: NOTCH, COMB and PPG VCF … see Sledge Hidden MIDI functions (PDF, source: VintageSynth). 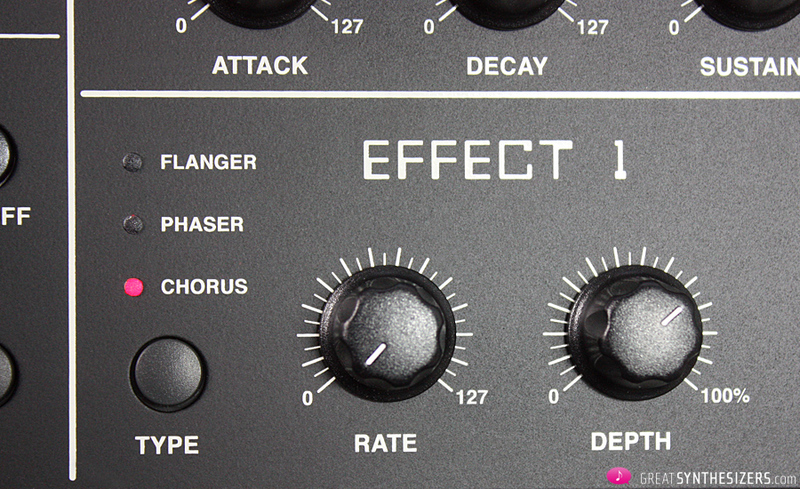 In addition to the classic LowPass mode, it’s the BandPass filter we like most. As illustrated in DEMO 2, BandPass filter sweeps can take on a silky and appealing quality. The directly controllable filter functions are FREQUENCY, RESONANCE, KEYTRACK, DRIVE and the (envelope) AMOUNT. Resonance allows for filter self-oscillation, but the resulting (aggressive) dominance can be problematic – more on that later. Filter and amplifier each have their own ADSR envelope. The filter envelope can be set positively or negatively and the amplifier envelope comes with a velocity function. For true sound designers among you, here are 3 (!) LFOs at your disposal. Two identical – but independent – main LFOs, as well as an extra LFO related to WHEEL / AFTERTOUCH movements. LFO SPEED remains kind of a mystery. No information on this in the (otherwise well written) user manual. 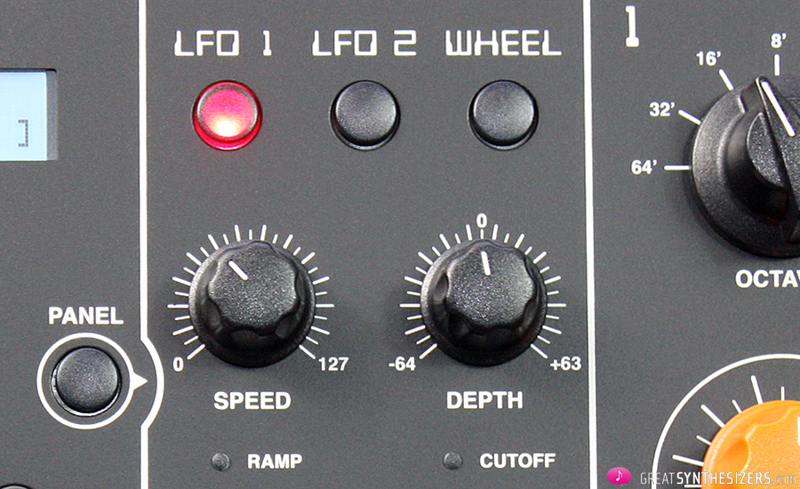 LFO speed ranges from “very slow” (which is very nice) up to the audio area … well, theoretically, at least. 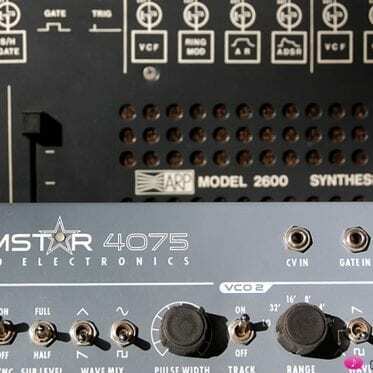 As with many digital synthesizers, modulations in audio range tend to end up as a desaster. Seems as if the obtained modulation effect can’t be calculated by the internal processor. 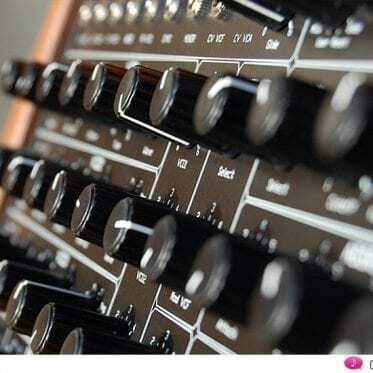 Instead, it reproduces a peculiar mix of alias sounds, bombastic acoustics and minor explosions. So, all modulations above 50 Hz (or so) end up uncontrollable. 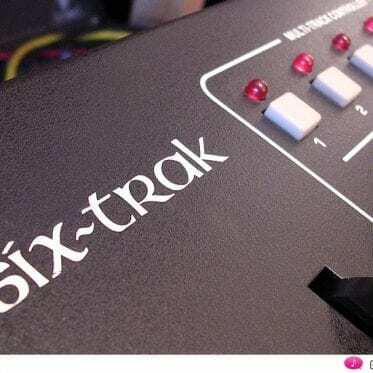 That makes clear why there are virtual-analog synthesizers that cost 3890 Euros (like the John Bowen Solaris) and others that cost only 890 Euros (like the Studiologic Sledge 2.0). The first have enough CPU power to truly simulate high-frequency audio modulations, and the second, well, they just don’t. Nevertheless, having 3 LFOs is superb. And there’s OSC-FM as well, for those drastic modulation effects. Which means there are heaps of modulation possibilities at your disposal. DEMO 3 focuses on this topic – have a listen! “Chorus” is gorgeous. Especially at slow rates, where the sound moves steadily from left to right. And “Delay” is again a pleasure, especially in conjunction with the Arpeggiator. The acoustically “correct” or “nearly correct” synchronization of delay- and arpeggiation-time ensures vibrant patterns. Minimal fluctuations in speed radiate a 70’s charme, reminiscent of those early works by Jean-Michel Jarre when he used tape delays. We’ll keep this part short. The arpeggiator (ARP) is good and useful, if not really extraordinary. 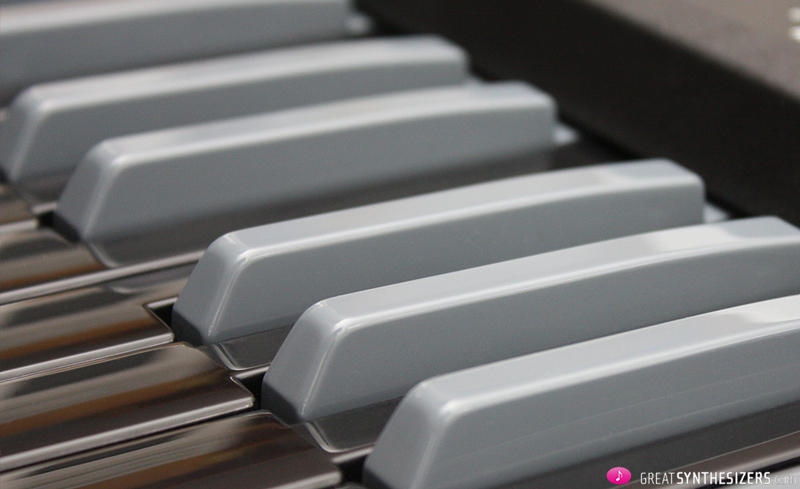 Playing modes include UP / DOWN / ALT UP / ALT DOWN, ranging from 1 to 5 octaves. The individual notes follow one of these chosen settings: AS PLAYED, REVERSED, KEY LO-HI, KEY HI-LO. Trigger Mode lets you choose between MULTIPLE and SINGLE triggering. 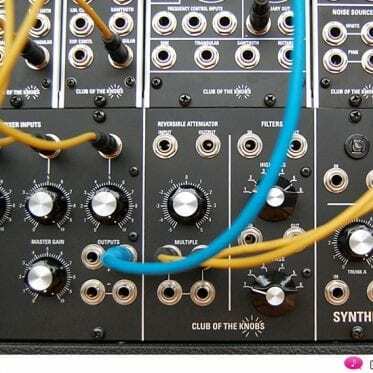 As with many analog synthesizers, it is possible to decide whether the envelopes, LFOs, etc. are automatically triggered with each note played, or only with the very first note you start with. MULTIPLE triggering means “free run” of all LFO modulations (very handy). SINGLE triggering is especially useful in GLIDE mode, where only over-bound (legato) notes trigger the glide effect. Selecting MONO turns Sledge into a “quasi” monophonic synthesizer. No matter how many keys you hit, only the last note will be audible. 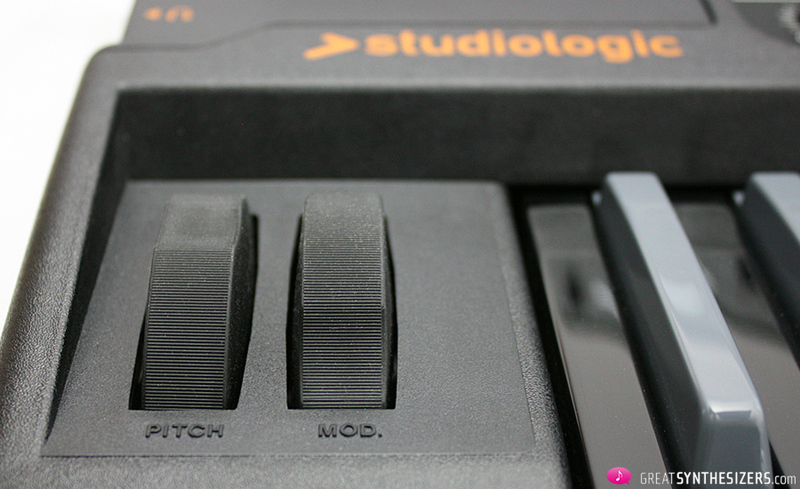 Ah yes … and there even UNISON mode … have a look at the hidden MIDI functions’ info. – At high settings, filter resonance is known to run out of control (very Korg MS-20-like). Screaming and aggressive. And since there is no transition from “little to maximum”, that aggressive tone color seems to jump into your sound, from one second to the other. – From time to time, there are unforseen peaks in the audio signal. By sensitively controlling the oscillator signals (mixer), the filter settings and the main volume control, these peaks can usually be avoided. – Although “LFO1, LFO2 (phase synchronized)” is claimed on the manufacturer’s website, we have no clue as to how to set this function. As far as we know, the 3 LFOs can not be synchronized with each other. They are all free running, function independently of each other. 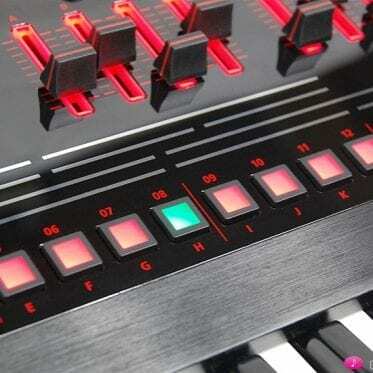 MIDI synchronization is also not possible. Now, these criticisms are not really criticisms, they are information for the customer. We prefer to say that care is necessary when programming or playing this instrument. That’s it! Pure enjoyment. Sledge time dimensions are of another world. Generous. With results that are not easy to put into words. Scenario “maximum release”: Set the filter and amplifier release time to maximum, play a note (or chord), listen to the full sound for the twinkling of an eye, then release the keys. 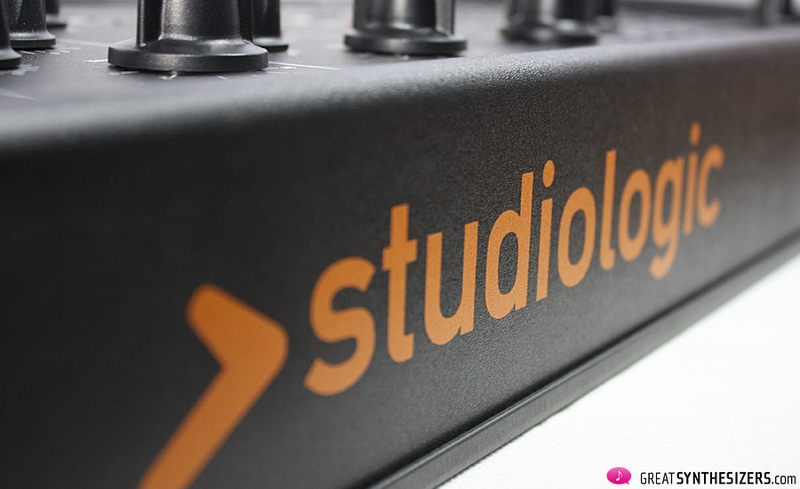 Now walk around a bit, listen to Studiologic Sledge (its sound is omnipresent in your studio), turn on the coffee machine, buy some milk in the shop around the corner, return to your studio, make some sandwiches … and notice with astonishment that the sound has remained unchanged. No audible volume drop, no release so far. While reflecting on the fact that the instrument might be damaged or that it might feature a hidden function you didn’t realize it had (maximum release could mean HOLD, right?) … slowly, veeery slowly release finally begins reducing the sound, minimally, barely measurably … exciting! Sitting on the couch (walking around just got boring at some point), you’re completely fascinated. How effective will the final fade-out be? Well – amazingly! The sound disappears gradually, very gradually, it fades away in some acoustic Nirvana without a hint of a hezitation. You sit there in deep meditation, close to tears, overwhelmed by that impressive transition from sound to silence. DEMO 2 tries to reflect the magic of long – ok, ok, in this case medium – Sledge release times. Listen! Attack times are impressive, too. Not quite as stunning as release behaviour, but still a lot better than the standard attack times of many synthesizers on the market. But the overwhelmingly long release does have a real soulmate: GLIDE. Speaking of maximal glide ranges, we’re talking of minutes, not seconds. Whether this is musically tantalizing (or not) depends on your personal taste. Turning the RATE knob counter-clockwise brings you back into the classic two-or-three-seconds glide range – just in case you’ve had enough of super-slow gliding. Sledge has 3 menues: ARP (see above), MIDI and GLOBAL. That’s it. Critics will surely miss the one or other feature, or the one or other detail … but I really like the simple (almost little old-fashioned) structure of the instrument. The MIDI menue contains: Channel, Local, Velocity Curve, Clock, Send / Receive Control. The latter function allows recording and controlling all (!) knob movements of Sledge. 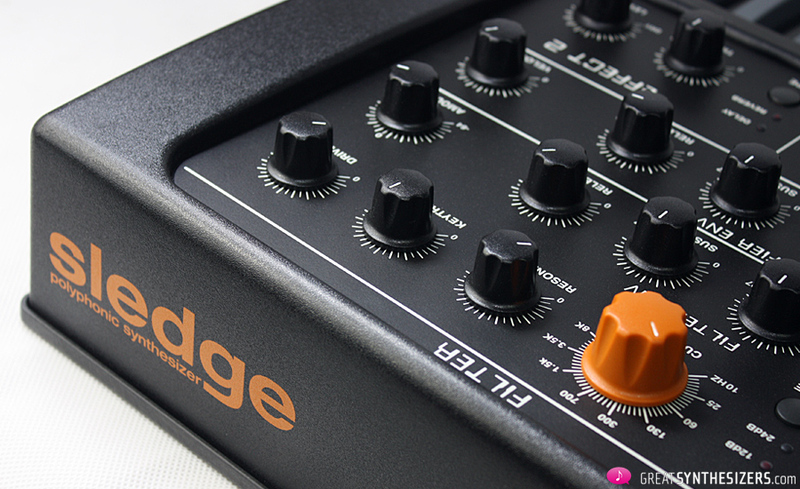 See the corresponding Sledge MIDI CC List (PDF, source: Gearsluts) for more details. The GLOBAL menue deals with all basic default settings, such as Tune (ranging from 430 to 450 Hz), Knob Mode (snap / direct), Pedal Assignments*, Pitch Wheel Range, etc. 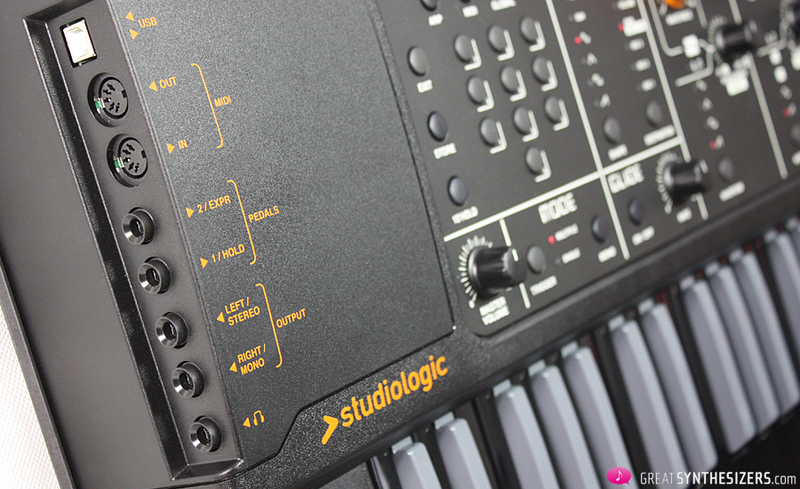 Sledge 2.0 / Sledge BLACK can play 2 sounds simultaneously – split or layered. For many (many) days, this was the well-kept secret of “how” to program 2 simultaneous sounds. Once you had done that (I won’t tell you how it works …), sustain pedal and pitchbender could be set to the one of the two sound only. Great stuff. However, you can load any sample (.wav file) into your Sledge and use it as a regular Oscillator 1 waveform – with all filter- and effect-processing, which is really useful. 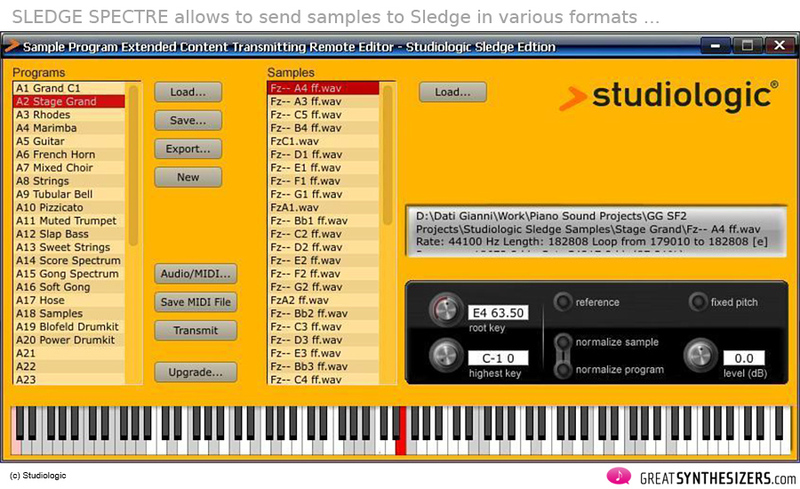 SLEDGE SPECTRE, a software which will manage, load and save your samples, is available for free at the Studiologic Website. Complex, rich in overtones, beguiling. So my observations and experience with the Sledge BLACK. Flexible, lively, expressive. So my findings when browsing the Sledge demos on Youtube. Almost immediately after purchasing the instrument, and just a few hours of sound research, Sledge had already risen high in my personal polyphonic synthesizer ranking. Many nuances of sound were new territory to me. 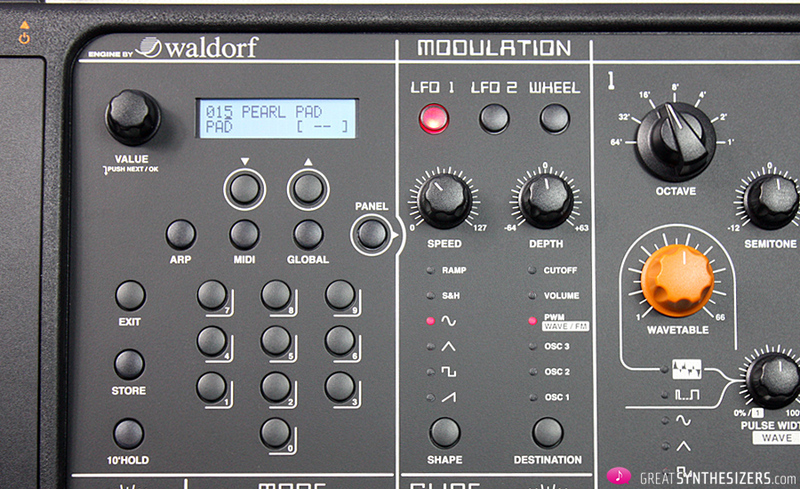 Sounds, which of course can be achieved with some other synthesizers as well, but often at the cost of operation potential (panels with just a few controls or overloaded structure menues – think of Waldorf Blofeld). The immediate, simultaneous, and (very importantly) intuitive Sledge access to all aspects of sound design amazes. But down to the nitty gritty. That intuitive sound doesn’t come on a silver platter. As a matter of fact, the Sledge PRESETS are rather AVERAGE. Dusty bass-, brass-, pad- and lead-sounds with a quacking filter here and much-too-fast-vibrati there — you get what I mean. But with just a little effort, you can turn those sounds into something special. And with that huge and knob-crowded Sledge panel, tweaking, playing and programming is relaxing and fun. Those “big” buttons are particularly useful. A starteling number of nuances – slow movements through wavetables, adjustments of fine oscillator beatings (> huge detune knobs! ), perfect adaptions of envelope times, etc. – can be effected with pinpoint accuracy. Potential for the creation of new timbres is in my opinion one of the greatest strengths of Sledge. Delicate overtones, shimmering wavetables nuances, tasteful use of the modulation wheel / aftertouch … The ingredients for that special sound recipy: 3 oscillators with wide audio range (64′ to 1′), a luxurious choice of waveforms (wavetables, samples, classic analog waveforms … even the odd PulseWidthModulation sounds great), combined with nuanced mixer possibilities and oscillator FM … and the availability of 3 LFOs (with individual control of oscillators, waveforms, frequency modulations). All this guarantees a barely comprehensible spectrum of tone colors / timbres. That gaudy yellow chassis (Sledge 2.0) or that classy dark gray chassis (Sledge BLACK) give no hint of the rainbow of sounds that could be at your fingertips. A tiny hint of “digital” in the sound character (not to be completely avoided), can be easily counterbalanced with good programming. We’ve attached 40+ minutes of audio material. As always, the demos reflect my special musical orientation. And as always they are just a small part of what you can do with the Sledge 2.0 / Sledge BLACK. 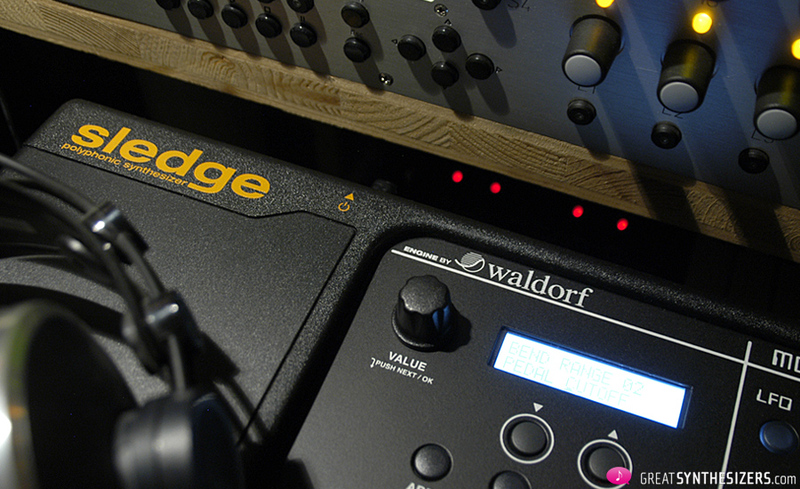 By the way, the used delay and chorus effects are all directly “Sledge”. Youtube videos should intensify your overall impression of the Sledge. I find the demos of Adam Borseti particularly comprehensive and sometimes quite funny. In addition to countless “hits” of synthesizer history, Mr. Borseti convincing presents Sledge E-Piano / Rhodes / Rock-Organ sounds, sensitive lead sounds and painfully good Vangelis imitations. The attached 40+ minutes of soundfiles are Sledge BLACK pure. Only exception: “DEMO 1” features a harmonica contributed by Arturia’s MatrixBrute. An Italo-French cooperation … how lovely. Sledge 2.0 / Sledge BLACK Edition are very special instruments. 890 Euros (Sledge 2.0) or 990 Euros (Sledge BLACK) gives you a 24-voice SYNTHESIZER in the true sense of the name. Sledge offers a huge variety of musically high-quality, easily adjustable sounds. If you’re in the mood for some serious filing, you can use OSC FM, OSC Sync, MultiMode Filter (BandPass! ), the 3 LFOs, the powerful ModWheel / Aftertouch performances … and you have complete control of all parameters via MIDI CC at your fingertips. Sledge is often compared to the Waldorf Blofeld. The two instruments have similar structures (3 oscillators, 24- or 25-voice polyphony, arpeggiator, …) and are equally powerful. Which gives you advocates here as well as there. On the one hand, the Blofeld with a more sophistcated sound design (e.g. two filters per voice). On the other hand, the Sledge that offers direct access to all sound parameters. But such comparisons are only of secondary importance. 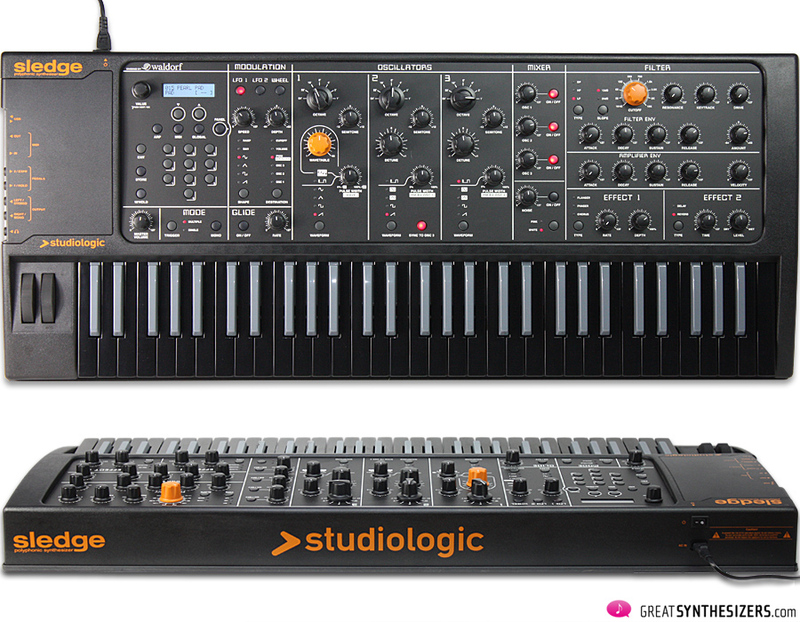 The point is: The Studiologic Sledge, as one of the most potent synthesizers on the market today, offers you excellent sound architecture and generous hardware for your money. With the OS2.51 both the Yellow and Black share the same electronics. My Yellow would not have the semi-weighed FATAR keys, but is electrically and OS identical to the Black Sledge. Novation Peak is great, yo (I assume that’s the hybrid you implied)! Absolutely great, actually. So how does it sound as a bass synth and what does the drive function sound like? Those two topics are not covered in the article. BASS LINE – PULSE and FILTER RESO & DRIVE. The first file is a slow bass pattern (pulse) with some additional filter sweeps. 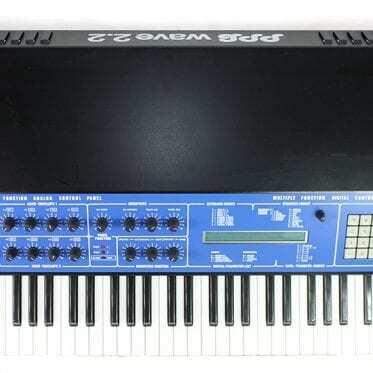 It shows that Sledge is an acceptable bass synthesizer. 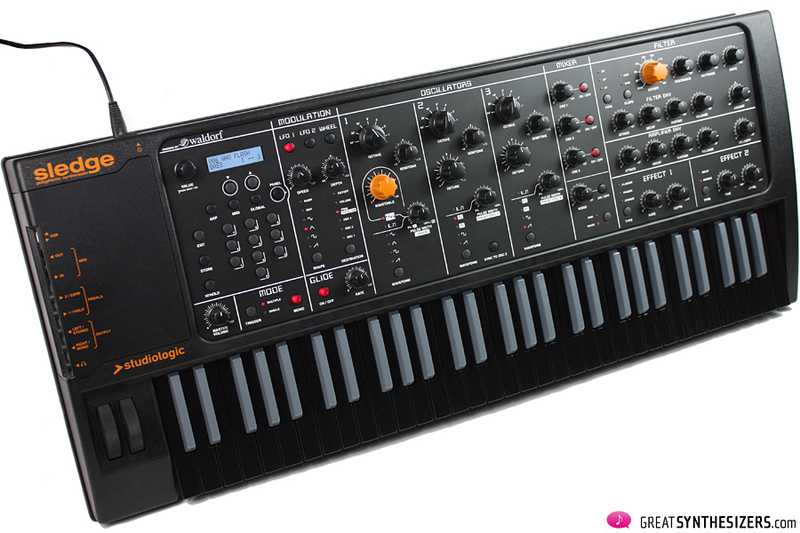 Not too Moogish (not really) and a little weak in the lower end – just like many digital (virtual analog) synthesizers. I’d say it’s “ok” for standard basses. 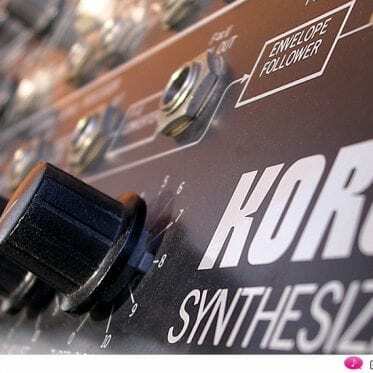 I have the experience, that the sledge can not substitude a real analog synthesizer. 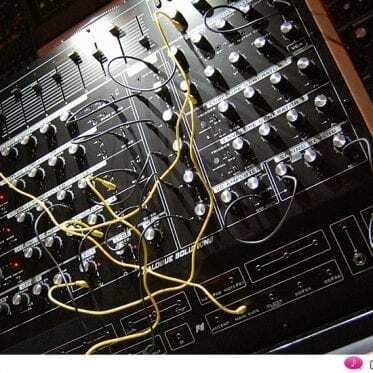 But in the Mix, this synth really makes an always great Job! I don’t know why, but as a Single Sound it is not the analog burner. Maybe the Mix needs the virtual exactness of a software Programm.